Lighter full-size sedan expected in summer 2015. Large sedans may no longer carry the status they once did, but to automakers they represent both premium and profitable models, serving retail and fleet customers alike. The Ford Taurus is one such vehicle, a model name rescued by CEO Alan Mulally soon after he took the helm in 2006. What was originally a midsize vehicle has morphed into a full-size model, replacing the aged Crown Victoria as Ford’s flagship sedan. Ford plans to keep making the Taurus and is now readying a new model in time for the 30th-anniversary edition. On Tuesday, Edmunds.com reported that an all-new Taurus is due out in the third quarter of 2015, citing an unnamed Ford source who shared some tidbits about the upcoming model. The next generation Ford Taurus will come in lighter than the current edition, losing the Volvo-based platform it has used for the past 10 years. The new model will be derived from the same one underpinning the Ford Fusion midsize sedan, stretched and widened to accommodate the Taurus. That move will allow Ford to share many components and hold down costs, a strategy that other automakers currently employ. Indeed, the Chevrolet Malibu (midsize) and Chevrolet Impala (large) are derived from the same platform as are the Toyota Camry (midsize) and Toyota Avalon (large) sedans. Expect Ford to make good use of light weighting, perhaps employing an aluminum body just as they plan to do with the 2015 Ford F-150 when it is released later this year. The new Ford Taurus will offer standard front-wheel drive with all-wheel drive optional. Its engine line up may change with Auto Trends forecasting that the now optional 2.0-liter EcoBoost engine will become the standard engine. Though the displacement is small, the four-cylinder engine currently produces 240 horsepower at 5,500 rpm and has an output of 270 foot-pounds of torque in the 2014 Ford Taurus. And that is in the base model weighing in at 3,964 pounds. Lighten the load and you’ll get a faster sedan and improved fuel economy. That should also allow Ford to offer the four banger will all-wheel drive, something it doesn’t provide with the current edition except with the V-6. The 2014 Taurus base engine is a 3.5-liter V-6 making 288 horsepower. 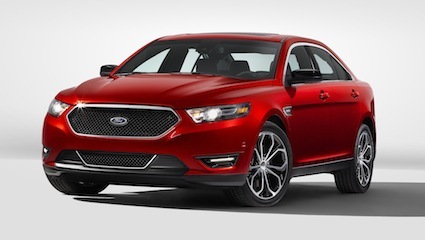 An EcoBoost version (with twin turbochargers and direct injection) is sold with the Taurus SHO, making 365 horsepower. Me thinks that the Taurus SHO may retain the larger engine while the all-new 2.7-liter V-6 slated for the Ford F-150 could become the optional engine for the standard Taurus. The larger EcoBoost would also be used in the Police Interceptor sedan, which is based on the Taurus. The transmission choices may be a bit more difficult to pin down, but a base Taurus could be paired with a six-speed automatic as currently used. Ford is also putting the finishing touches on a nine-speed automatic, what would be used elsewhere. That transmission if optionally paired with the 2.0-liter EcoBoost engine should help the Taurus achieve at least 35 mpg on the highway (up from 32 mpg), tops in its segment. With start/stop technology, light weighting and various aerodynamic adjustments such as automatically closing shutters, 25 mpg in town would be within reach. It wasn’t too long ago that compact sedans produced similar numbers. Looking a bit further out, the Taurus might also offer a hybrid system, providing yet another way for Ford to meet ever-increasing federal fuel economy mandates. Sales of the Ford Taurus increased by 4.5 percent in 2013, with 69,063 units sold. Add in sales for the Police Interceptor sedan and nearly 80,000 units rolled out of the factory door, up by more than 50 percent over 2009 reports Reuters.